I have had such bad skin lately so i did a bit of research on different face wash and skin products. 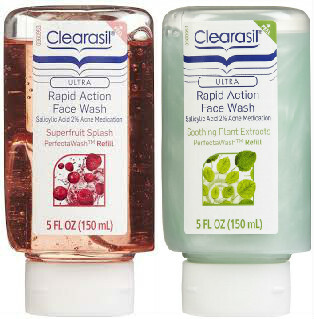 I haven't used Clearasil in years but i thought i would check out what products they are doing these days, i eventually came across the Clearasil PerfectaWash Dispenser & Refill Face Wash and thought it looked really good. But before diving in and buying it i decided to do my research and see what other people thought of it and if they recommended it, which i was pleased to see they did. The thing i like about it is the dispenser it comes with and that i don't have to squeeze face wash out of a bloody bottle! I ordered this yesterday so it should be here sometime soon hopefully, i didn't want to pay the full price of £12.99 so i got it for £4.99 from Fragrance Direct. "The right amount of the right product is key to visibly clearer skin without overdrying. Introducing Clearasil® PerfectaWash™. The Automatic Face Wash Dispenser delivers the perfect dose of strength & kindness for visibly clearer skin without over drying." Touch-free automatic face wash dispenser delivers the perfect dose of strength and kindness. Contains Vitamin E known to nourish skin and extracts of raspberry & cranberry superfruit know for their antioxidant properties to help keep skin looking healthy. This product comes with two different face washes Superfruit and soothing plant, i think i will end up liking the soothing plant one more just because it sounds more to my liking. Superfruit Splash formula features raspberry and cranberry extracts for a luscious scent and gentle but effective cleanse but Soothing Plant Extracts formula features ingredients known to nourish and soothe the skin. I would prefer my skin to be soothed and cleansed at the same time but apparently each one does one of these things. The refills are £2 each at Boots, so they are lovely and cheap for you to replace. Once i have used it for a few weeks i will let you all know what i think of it, or if i recommend it myself. I am actually really excited about getting it, so fingers crossed it lives up to the hype! I would also like to say thank you to my lovely followers i have 41 now and i never thought anyone would read my blog, also thank you to my sister Stefi for taking the time to do my layout and redesign everything, be sure to check her out. I used to have bad skin too and face wash wasn't enough which was so annoying. I tried HRI clear complexion tablets and they worked a treat, obviously with face wash and cutting down my makeup! I love your posts, it would be great if you take a look at my blog and follow it too!